The Montgomery County Planning Board will hold work sessions on the Greater Lyttonsville Sector Plan starting in March 2016. The sessions will continue as needed for the Board to fully discuss the community testimony as well as issues Board members want to address. At the conclusion of the work sessions, the Plan will be revised at the Planning Board’s direction before being transmitted to the County Council and County Executive as the Planning Board Draft. The County Council will hold a public hearing on the Planning Board Draft of the Greater Lyttonsville Sector Plan later in 2016. View the Greater Lyttonsville Worksession Schedule and listen live (worksessions will be held at Montgomery Planning Headquarters, 8787 Georgia Avenue, Silver Spring, MD 20910). The Planning Board Draft was approved by the Planning Board on July 14. The Planning Board Draft presented to the Board included the changes made in response to the requests by the Greater Lyttonsville community to clarify the use of the urban road code, district boundaries and language in the Plan Draft. It also included the addition of the proposal by EYA. View the Planning Board Draft. The Montgomery Planning Board held a public hearing for the Greater Lyttonsville Sector Plan at its headquarters on February 11, 2016. Community residents and property owners testified primarily about proposed zoning changes in the Plan and their potential effect on density, school capacity and transportation issues. 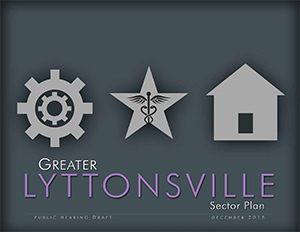 View the Public Hearing Draft of the Greater Lyttonsville Sector Plan[PDF] (pdf, 12MB). This posting follows the Montgomery County Planning Board’s approval of the Working Draft as the Public Hearing Draft on Thursday, December 17, 2015. The Public Hearing Draft reflects changes in response to issues that were raised by the Lyttonsville community over zoning classifications, district boundaries and language in the Plan Draft. 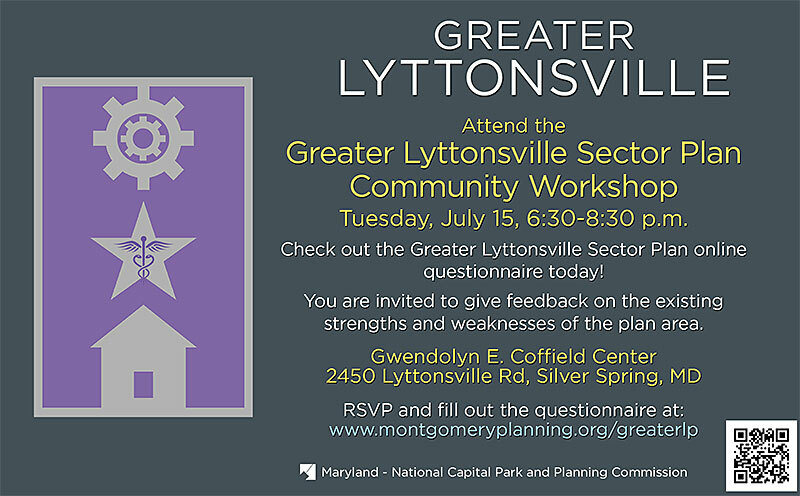 The public is also invited to submit comments on the Public Hearing Draft of the Greater Lyttonsville Sector Plan via email to mcp-chair@mncppc-mc.org. These comments will become part of the public testimony and public record for the Plan. 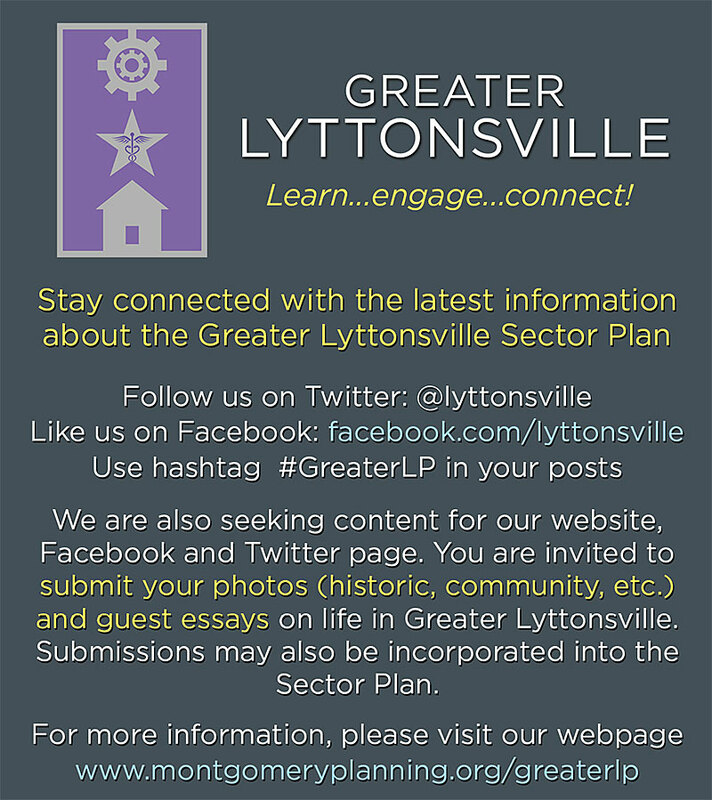 Learn more about the Greater Lyttonsville Sector Plan Public Hearing Draft. View the November 18 GreaterLP community meeting presentation here [PDF]. 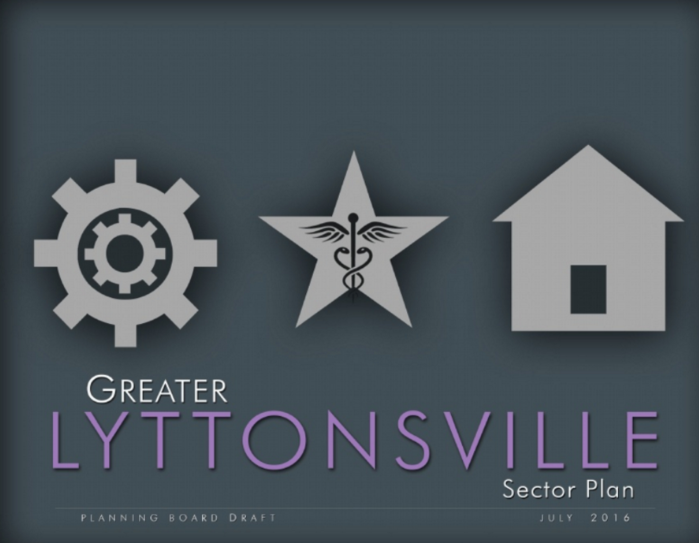 Review the Greater Lyttonsville Sector Plan Briefing Book: The briefing book [PDF] (pdf, 38MB)summarizes the existing conditions within the Greater Lyttonsville Sector Plan Area as of April 2014. It is intended to be used as a reference for the Sector Plan community. 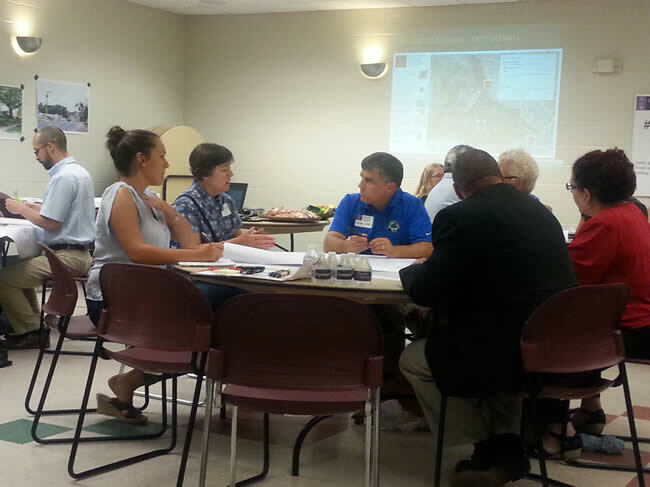 Planning Staff hosted a series of Monday evening meetings in June for the Greater Lyttonsville community to attend and learn more about the planning process for the Greater Lyttonsville Sector Plan. Various stakeholders learned about specific subject areas such as: urban design, historic preservation, land use, parks, environment and transportation. The planning team discussed these subject areas and how they will contribute to the overall plan, which will form the foundation for transforming the heart of Greater Lyttonsville. The Monday Matters meetings were held on June 2, 9 and 16 from 6 – 7:30 p.m. at the Gwendolyn E. Coffield Center (2450 Lyttonsville Road, Silver Spring, MD), 2nd Floor Classroom). As a follow-up to the successful relaunch meeting held in early May, the planning team invited residents, property owners, and business owners to give their feedback on preferences for the Plan Area, to better understand current issues to make informed decisions for the future. View the staff presentation here. View the summary maps [PDF] here. View the breakout group work [PDF] here. 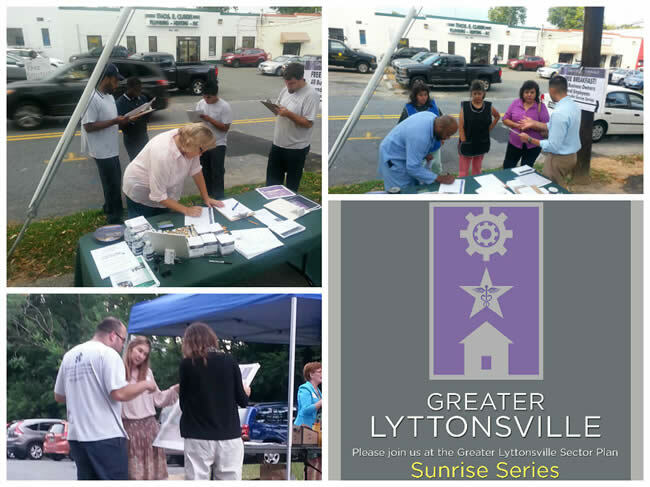 The Montgomery County Planning Department hosted two meetings as part of their “Sunrise Series” for business owners in the Greater Lyttonsville Sector Plan area on Thursday, July 31 and Thursday, August 7. The purpose of these meetings were to provide an opportunity for the business community to ask questions and give feedback on the sector planning process. The early morning meetings offered free breakfast, an opportunity to meet with planners and gave the chance for attendees to answer a questionnaire. October 20, 2015- Office Hours, Coffield Center 12 p.m. to 6 p.m.
September 22, 2015- Office Hours, Coffield Center 12 p.m. to 6 p.m.
Planners reported on the open house held in March, offered a snapshot of the area’s present and future, and ran a ‘What’s on your radar?” exercise to help inform the plan goals. 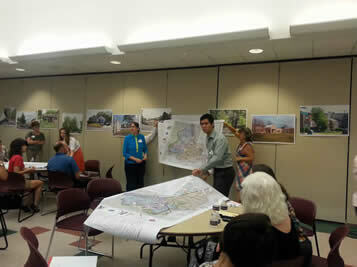 Planners learned more about the community’s strengths and what residents would like to see change. Read the press release. In addition to coming to outreach events, you can schedule a time to meet with Staff in our offices in Silver Spring, in Greater Lyttonsville, or at your own group’s meeting. To schedule a time, contact us! You can also host an event, such as a happy hour or reception, for conversation about your interests or concerns. We will be pleased to attend. We will regularly update this list to let you know with whom we’ve been meeting. Public Meetings/Workshops are in bold and are hosted by the Montgomery County Planning Department.